Cannabidiol (CBD), when derived from hemp, is a nationally accessible cannabinoid that can help bring balance to the body without getting you “high.” At Hempsley, we believe CBD therapies can be an option for those living in prohibition states, and we want our readers to be well-informed on those benefits, as well as the potential effects CBD can have on other medications you may be using. Read on to learn more about how CBD works and safety precautions to consider when using this medicine in your wellness routine. Cannabinoids are molecules that bind to receptors throughout the body and brain. Cannabinoids are subdivided into endocannabinoids, phytocannabinoids, and synthetic cannabinoids. Endocannabinoids are chemical messengers that our bodies create on demand to regulate stress, emotion, memory, movement, appetite and more. Phytocannabinoids are chemical messengers created within the cannabis plant which can produce similar effects as endocannabinoids when consumed. Synthetic cannabinoids are those that have been man-made, such as dronabinol, nabilone, dexanabinol, and more. While our bodies have been evolving with the endocannabinoid system for millions of years, we are just scratching the surface of understanding how these unique chemical messengers help keep us healthy. Unlike other neurotransmitters, which are stored and released within the body, endocannabinoids are produced on demand and then immediately used. They also work in surprising ways. 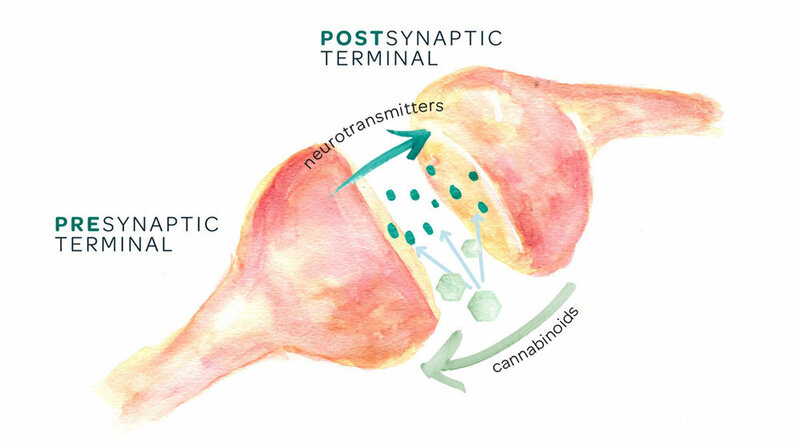 While other neurotransmitters send information from the presynaptic vesicle of one cell to the postsynaptic vesicle of another, cannabinoids actually move backwards. They are created on demand and then travel from the postsynaptic vesicle of one cell back to the presynaptic vesicle of another, modulating the message that was just sent. Research is proposing that certain conditions may be a result from endocannabinoid deficiency, meaning the body doesn’t produce enough endocannabinoids on its own to regulate the constant messages that the nervous system is sending. Diseases that are potentially associated with endocannabinoid deficiency include epilepsy, migraines, Irritable Bowel Syndrome, fibromyalgia, and chronic pain. Individuals that are low on endocannabinoids may find relief from cannabinoid therapies. In the most basic layman’s terms, cannabinoids are powerful communicators in our bodies. Their ability to regulate messages on a neural level means they can have a vast impact on homeostasis, energy, stress, and immunity. In the endocannabinoid system, there are two key endocannabinoids that our body produces on its own, anandamide and 2-AG. Anandamide borrows its name from the Sanskrit word ananda, which means joy, bliss, and delight. Nicknamed the “bliss molecule,” anandamide could be a cannabinoid ally against depression and anxiety and has been shown to modulate mood, memory, appetite, fertility, and is even believed to halt the proliferation of cancer cells. Aarachadonal glycerol (2-AG ) is the most abundant endocannabinoid in our bodies. It binds very strongly to the CB1 and CB2 receptors embedded throughout the central and peripheral nervous system, and it behaves similarly to tetrahydrocannabinol (THC). 2-AG is believed to regulate sleep, immunity, pain, and appetite. CBD is a phytocannabinoid derived from the cannabis plant and is currently the only cannabinoid readily accessible in all 50 U.S. states. CBD’s role within the body is just as unique. Unlike other cannabinoids, CBD does not bind to receptors in the endocannabinoid system. Instead, it stops the breakdown of our own endocannabinoids. The main action it performs within the ECS is the inhibition of fatty acid amide hydrolase or FAAH. FAAH breaks down the anandamide molecules naturally occuring in our body, and CBD works to prevent FAAH from destroying this bliss molecule. In this way, CBD can work indirectly all throughout the body, ensuring that we have enough anandamide to manage our pain, mood, appetite, stress, and sleep. Since CBD does not bind directly to endocannabinoid receptors, like the other well-known phytocannabinoid THC, it does not produce the intoxicating, “high” effect often associated with cannabis. CBD is like any other medication in that it is best to be as informed as possible before incorporating CBD into your wellness routine and to seek professional opinions first. Many are finding that CBD can present a viable alternative to other pharmaceuticals. In a recent survey of scientific literature, CBD was found to have a better side effect profile than other drugs when treating epilepsy and psychotic disorders, with only minimally reported side effects like tiredness, diarrhea, and changes to weight and appetite. However, CBD can interact with other medications you are already taking. These interactions are not necessarily harmful, but CBD might alter the effects of these other medications. For instance, if someone is taking clobazam, a prescription anticonvulsant, while also taking CBD, the two medicines will both be broken down in the liver and compete with each other. CBD will block the enzyme in the liver that breaks down clobazam therefore increasing clobazam levels. CBD has also been shown in clinical trials to increase liver enzymes, which could indicate damage or inflammation to the liver. Individuals utilizing CBD should consider having their liver enzymes checked periodically. Additionally, smoking any substance (cigarettes, cannabis, herbal blends) can reduce the effectiveness of certain medications. Smoking produces hydrocarbons, which we inadvertently consume and which alter our metabolization process. Hydrocarbons speed up the process of metabolization in the liver, meaning that medications are more broken down by the body and the effects are decreased. The hydrocarbons in smoke can negatively interact with certain antidepressants and antipsychotics, so always proceed with caution when smoking any substance. Dr. Michael Barton, Clinical Pharmacist, has provided us with a list of medications that may interact with CBD. This list is not all inclusive and the clinical significance of most of the interactions has not been determined. This article would not have been possible without Dr. Barton’s expertise and insight, and we extend so much gratitude for his knowledgeable help! He believes that every facility dispensing medical cannabis should employ an on-site pharmacist to help patients make sound decisions about using cannabis, and we urge our readers to seek professional opinions as well. If you think CBD could bring relief and balance to your well-being, please speak with a physician or pharmacist first. Pro tip: If you are looking for a specific medication, use the keyboard shortcut Command/Control + F to search the medication on this page. CBD products may contain alcohol. Metronidazole and disulfiram interact with alcohol and can cause nausea, vomiting, headaches, and flushing. This article was written by Kira G. — we are so grateful for all of her research and hard work to put this together for you! Special thanks to Clinical Pharmacist Dr. Michael Barton for providing his insight on this topic and fact checking its accuracy. This article was illustrated by Kristen Williams, Founder & CEO at Hempsley. Fisar, Zdenek. “Phytocannabinoids and Endocannabinoids.” Current Drug Abuse Reviews, vol. 2, no. 1, 2009, pp. 51–75. Frankeberger, Joshua. “Michael Barten Clinical Pharmacist Reviews Cannabis as a Medicine.” YouTube, YouTube, 25 Apr. 2018, www.youtube.com/watch?v=c1zifDibceo. Iffland, Kerstin, and Franjo Grotenhermen. “An Update on Safety and Side Effects of Cannabidiol: A Review of Clinical Data and Relevant Animal Studies.” Cannabis and Cannabinoid Research, vol. 2, no. 1, 2017, pp. 139–154. Maccarrone, M, and A Finazzi-Agrό. “The Endocannabinoid System, Anandamide and the Regulation of Mammalian Cell Apoptosis.” Cell Death & Differentiation, vol. 10, no. 9, 2003, pp. 946–955. Sensi, Seshata. “What Is 2-AG?” Sensi Seeds Blog, 3 Apr. 2013, sensiseeds.com/en/blog/cannabinoid-science-101-what-is-2-ag/. Gaston TE, Bebin EM, Cutter GR, et al. Interactions between cannabidiol and commonly used antiepileptic drugs. Epilepsia 2017;58:1586–1592. Flockhart DA. Drug Interactions: Cytochrome P450 Drug Interaction Table. Indiana University School of Medicine (2007). "/clinpharm/ddis/clinical-table/" Accessed June 6, 2018. Stout SM, Cimino MN. Exogenous cannabinoids as substrates, inhibitors, and inducers of human drug metabolizing enzymes: a systematic review. Drug Metab Rev 2014;46:86-95. Yamaori S, Koeda K, Kushihara M, et al. Comparison of In Vitro Inhibitory Effects of Major Phytocannabinoids and Polycyclic Aromatic Hydrocarbons Contained in Marijuana Smoke on Cytochrome P450 2C9 Activity. Drug Metab Pharmacok 2012;3:294-300.